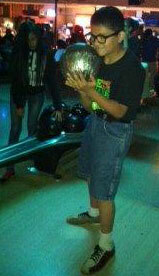 Older students enjoyed bowling in downtown Chamberlain. The Lakota students started the day off with Monte Carlo bowling at the Chamberlain Bowling Dome. We had lots of laughs and witnessed some amazing bowling talent. One student hit a split that a professional bowler would not be able to knock down! That accomplishment won her a $15 cash prize. We gave 40 prizes away to students that hit a strike with a colored pin showing. The music and pizza made the morning even more memorable! The afternoon consisted of a movie at the State Theatre downtown. We watched “Crooked Arrows.” Students cheered for this feel-good sports thriller about Native Americans playing lacrosse and learning about loyalty to their tribal heritage. 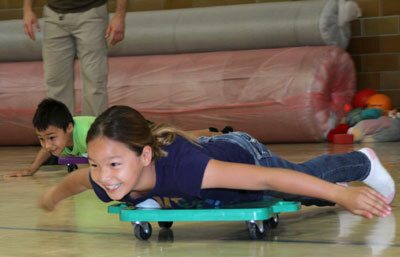 Younger students played team games in the gym. St. Joseph’s younger students enjoyed the morning with some bingo, team challenges, and inflatables. The inflatables will not be forgotten! The kids had a blast with Extreme Basketball, Jurassic Bouncer, Giant slide, and Jumbo Course inflatable. As they say, time flies when you’re having fun! Students got quite a workout and were ready for lunch. We ended the afternoon with a trip to the State Theatre to see the movie, “Rise of the Guardians.” Students were excited about the movie; popcorn and a soda only added to the excitement. 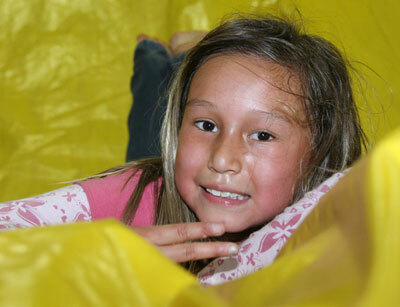 The Lakota children got quite a workout playing on the inflatables! The day was a great success and students finished their year out at St. Joseph’s with something to remember until we see them back when the new school year begins! Looks like great fun was had by all. What fun AND prizes too? WOW..